A beautiful and uniform smile is easily achieved through cosmetic orthodontic treatment. Whether you’re a teenager wanting the perfect smile for school photos, or you’re approaching middle age and finally want to take care of unsightly gaps, there are effective and convenient orthodontic solutions to help you restore aesthetics. 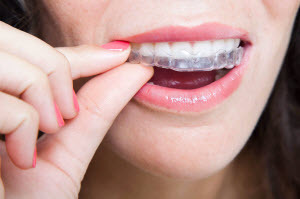 Dr. Bill Vagenas and our dedicated staff at Vagenas Dental enjoy seeing our patients benefit tooth straightening options such as Invisalign clear braces in Brockton. Call our office today if you have questions about correcting a crooked smile. Our patients can expect comprehensive x-rays and impressions to help determine the full scope of your oral health. We discuss various options and base a treatment plan that restores uniformity and aesthetic appeal to your smile. Unless your case involves more complicated issues, our doctors can provide effective treatment with Invisalign® clear aligners. When malocclusion is more significant, we recommend traditional braces to correct the misalignment. Once impressions are taken, and it’s been determined you are a good candidate for Invisalign, the customized trays are manufactured to your exact specifications. Each set of trays are worn for two weeks, then replaced with a new set that further guide your teeth into the appropriate space. We’ve helped patients with minor misalignment achieve their desired smile in as little as two months, but are also equipped to provide great results for more complicated cases of uneven teeth that may take up to two years to obtain comprehensive and permanent results. The advantages of choosing Invisalign invisible braces are numerous, including improving both oral health and aesthetics. The visual appeal allows patients to be more confident in their appearance. Since straighter teeth are easier to maintain, they benefit the health of your gums and the long-term function of your teeth. The most convenient aspect of treatment is that the trays are removable, allowing for easier brushing, flossing, and eating. In addition to the original Invisalign clear aligners, we also offer Fastbraces®. This orthodontic option uses unique triangular brackets and a specialized square wire to move both the crown and the tooth root from the start of treatment. Because of this, treatment time can be significantly less than with alternative options. At Vagenas Dental, Dr. Vagenas has provided our patients with beneficial orthodontic treatment in Brockton and surrounding communities for years. If you are interested in efficient teeth straightening treatment, call our office today to set up an appointment.